Monday nights are fairly tame at the DBAP, but Tony Gwynn drew a crowd of autograph hounds on 7/26. I suspect he's recuperating from writer's cramp. Over a thousand fans lined up to meet the San Diego Padres legend. He played his entire Major League career in southern CA, but the slugger is very much appreciated on the east coast, too. What a friendly, gracious guy! He gave autographs, posed for photos and chatted up the fans. 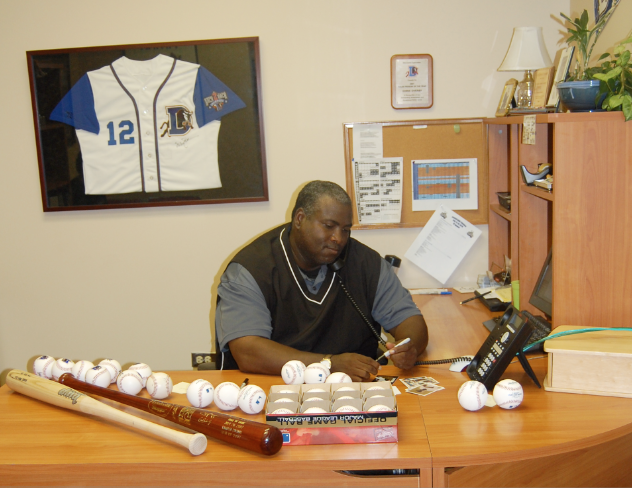 In Durham on behalf of the Air Force Reserve, Gwynn visited both clubhouses and met with our staff. He's a multi-tasker as you will note in the photo below...sitting at our sales manager's desk autographing stuff and doing an interview with Adam Gold at 99.9fm/The Fan over in Raleigh. Gwynn's day job is head baseball coach at San Diego State Univ...where he coached Washington Nationals' phenom Stephen Strasburg. Tony Gwynn, Cal Ripken Jr., Jim Palmer, Joe Morgan, Phil Niekro, Hank Aaron, Ozzie Smith, Johnny Bench, Ryne Sandberg, Wade Boggs...plus Paul Hornung in football and Magic Johnson in hoops. 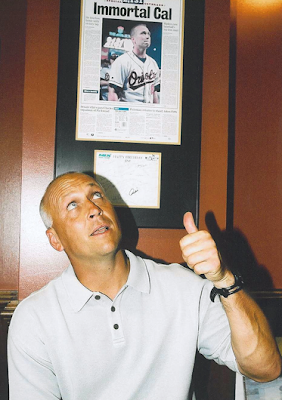 Here's a classic Cal Ripken shot from the vault. He's in our Owner's Suite sitting beneath a framed newspaper story. Our company used to own a radio station in Baltimore, and we all reveled in Cal's 1995 career milestone. He broke Lou Gehrig's record for consecutive games played - 2,131. There's MAGIC in the DBAP! 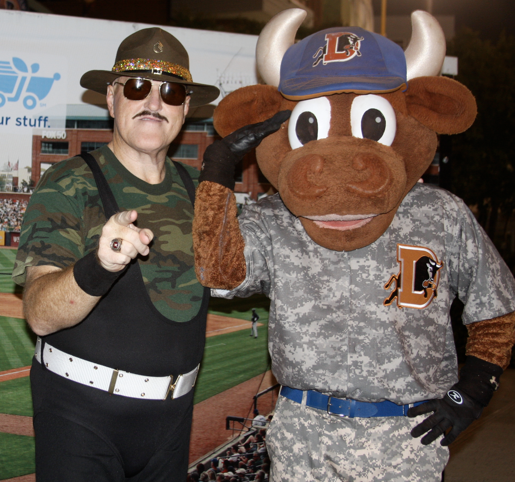 The Durham Bulls staff is peopled by the Warrior Archetype…others need not apply…think martial arts films. 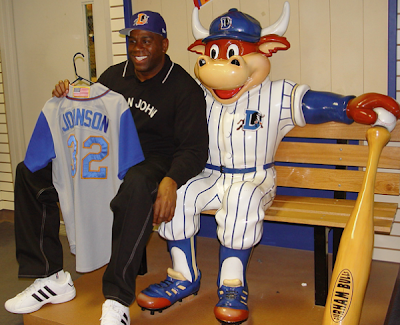 Bulls employees are loyal, devoted, tenacious and uncommonly strong. How else could they endure Sunday’s record-setting 102 heat? (The heat index was 112). How else could they survive 25 games over 32 days? How else could they attempt a tarp pull as a severe storm rolled across Goodmon Field Sunday night? The game was stopped not because of rain, but because the umpire crew chief saw two trash cans and a recycling can go airborne from the Diamond View concourse…and land on the bottom of the centerfield hill. We then rolled the tarp out from the wall, and the heavy winds started blowing what we had already rolled out over itself. We tried to pull it onto the field but the back side kept blowing high into the Durham sky. As we attempted to hold it down, several of us were dragged across the field as we held onto the tarp. This happened several times. (Blogger’s note: Scott was holding a strap with both hands as he was pulled across the field on his stomach!) After a lot of wind and even an assist from Wool E. Bull, the tarp was finally in position and staked down. I tried a tarp pull about ten years ago…thought I was going to die after sprinting across the field. Thereafter, I submitted a note from my doctor. This is Warrior’s work! 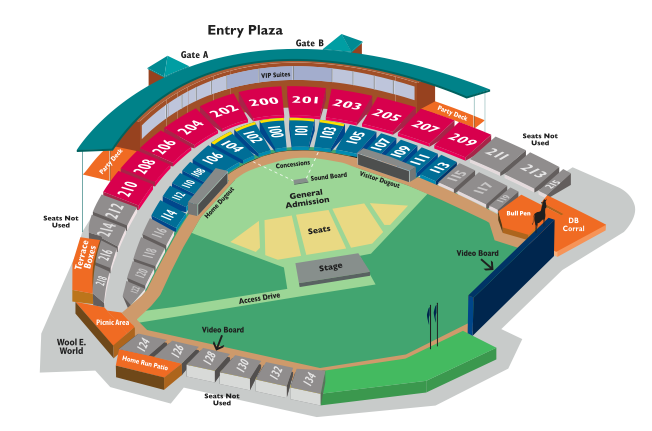 Some teams leave this task to the grounds crew or municipal employees who work at the ballpark. Not so at the DBAP. It’s a team effort. Our GM and resident mudder Mike Birling sets the tone and leads the charge. This is Warrior’s work! People are calling me for Miranda Lambert tickets…long lost friends…calling in favors. I’m surprised that some of them are country fans…closet country fans!?! But it’s all good. 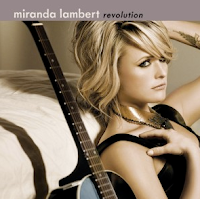 There seems to be a lot of interest in our October 14th concert: CMT on Tour - Miranda Lambert Revolution 2010. Tickets go on sale TODAY to the general public. 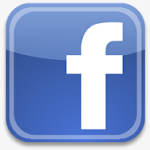 BTW, I’m directing those long lost friends to our web site…with their credit cards. This is business. 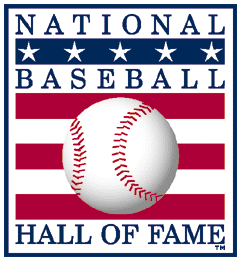 My country bona fides can be carbon-dated to the early 1970’s…to my first job in the broadcasting biz. It was at a country station in Richmond, VA. We played a lot of Conway Twitty, Tammy Wynette, Merle Haggard, Charlie Pride and Loretta Lynn. That was good stuff, but I really enjoy today’s emerging artists. Lots of energy. Authentic lyrics. Like Miranda Lambert! Vintage RIC transit advertising from my archives. Today, 1380-AM is a Latino Christian station. No, I’m not writing about the World Series. As the 2010 season reaches a crescendo, the Bulls will host two BIG non-baseball events at the Durham Bulls Athletic Park in October. The World Beer Festival is October 9th. Presented by All About Beer Magazine, it’s so popular there are two sessions - afternoon and evening. 150 breweries are represented. The WBF has already made stops in Columbia, Raleigh and Richmond this year. Durham is the grand finale for this event that’s been mentioned in USA Today, Forbes and Wired. Click here for details. Click here for ticket info. CMT on Tour - Miranda Lambert Revolution is October 14th. 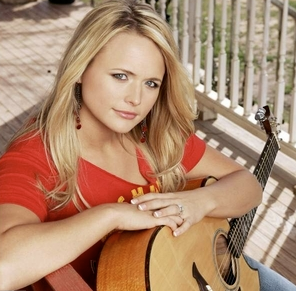 Miranda is wildly popular…raking in awards…consistently topping the country charts. She has evolved from opening act to headliner for this fall tour that stops in Durham. Her current hit, on the tender side, is The House That Built Me, but she’s known for her edge...showing no mercy to former boyfriends. She an avenger, not a victim! Tickets go on sale Friday. 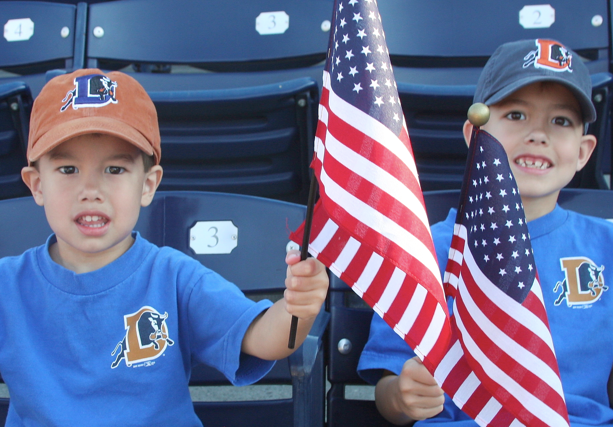 The DBAP is a great place for baseball…and we aim to make it an outstanding concert venue as well. Join us in October! 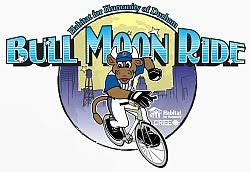 The Bulls sponsor, host and promote the Bull Moon bicycle ride. The 2010 circuit (last Saturday evening) was a big success raising over $30K for Durham Habitat. That will jump-start construction of a new Habitat home, and it will put another Bull City family on the path to home ownership. I step aside and give the credit to 567 riders and the title sponsor, Cree. How appropriate that Durham’s LED manufacturer sponsored a nighttime event in need of lighting. Cree even gave-away Coleman headlamps that are made, of course, with LEDs! I really like this event. You don't have to be cycle-obsessed with Tour de France aspirations. It’s more of a family affair…you can take it easy...on a summertime Saturday night. There were two routes – ten and eighteen mile treks – both through downtown. The longer course incorporated the American Tobacco Trail. We ran into Lucky Jr., the Bulls’ canine mascot, outside the ballpark Friday evening. 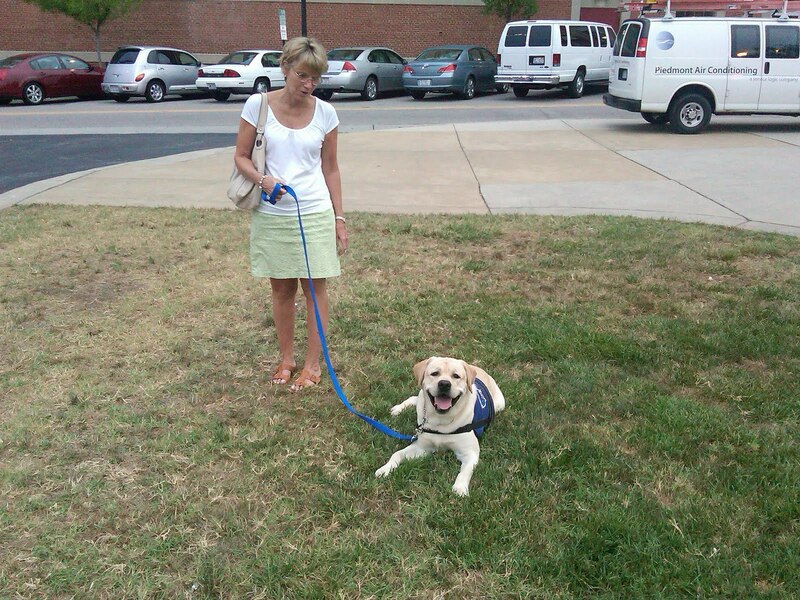 Lucky isn’t allowed to relieve himself on the DBAP turf, so he has to leave the ballpark when nature calls. What a gentleman. Lucky Jr.’s predecessor, Lucky the Wonder Dog, retired in May. 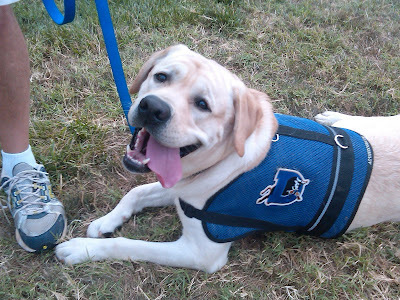 He was a ballpark regular at weekend games since 2003. Lucky Jr. is still learning the ropes, but with that endearing face and winning smile, he will have his own fan club soon enough. He's well on his way to Wonder Dog status! We used our July 4th game as a platform to recognize "good things happening in Durham" as Mayor Bell is fond of saying...and two groups serving the Bull City. 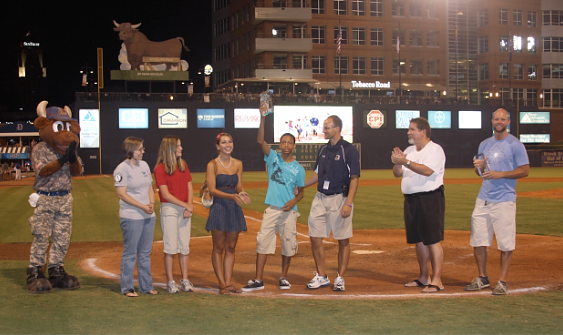 With a captive audience of 12,000 - awaiting the fireworks show Sunday night - Durham's annual It's Cool to Care awards were announced. On the left are young folks from Durham Habitat's YOUTH UNITED. On the right, representatives of TEAMING FOR TECHNOLOGY, an arm of United Way of the Greater Triangle. They're receiving their service trophies from Bulls' GM Mike Birling and Wool E. Bull. 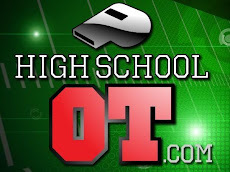 Please, click on the links above and watch the videos. Learn more about these great organizations. HATS OFF to Al Reynolds and Joe Burgess with T4T...and to Deidre Callahan and her crew of YOUTH UNITED at Habitat. Yes, it's cool to care! Praise the Power that hath made and preserved us a nation. And this be our motto: "In God is our trust." 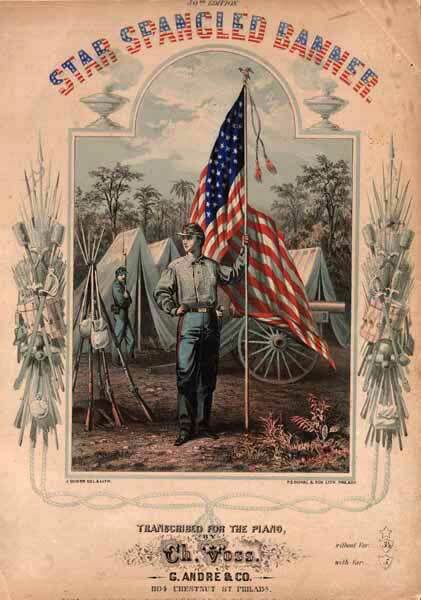 O'er the land of the free and the home of the brave! Bulls players wore custom-made camo jerseys last weekend and they will be auctioned off July 4th. Proceeds go to the USO. The jerseys will be on display during Sunday’s game as a silent auction resumes on the ballpark concourse. That’s Sgt. Slaughter with Wool E. Bull in his camouflage attire at our June 26th game -Military Appreciation Night at the DBAP. Sgt. Slaughter is a rasslin’ legend who inspired the GI Joe action figure that bears his name. Actually, he’s a heck of a nice guy! There are over 400,000 soldiers stationed in NC. The USO will serve about 50% of them at centers in the Raleigh-Durham International Airport, Charlotte, Jacksonville and Ft. Bragg. At RDU the USO will be moving into the new terminal. SUPPORT OUR TROOPS…and bid on a game-worn camo jersey July 4th.